The holidays are about giving, but sometimes giving can be dangerous. If you’re like me, you might like to share things with your pet, like your food, bed, couch, blankets, etc. There are some holiday dishes you should rethink sharing with your pets. We have a list of ingredients that are harmful along with some yummy recipes safe for the furry members of the family! 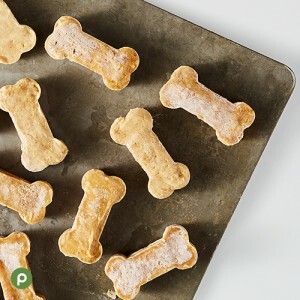 Try these pet-friendly recipes so you fur baby can enjoy a tasty treat too! Combine the peanut butter with the mashed banana and a little water. The water will help the consistency of the mixture and help with freezing. Spoon the mixture onto a wax paper lined cookie sheet or into a cookie mold for a desired shape. Allow the mixture to freeze for several hours or overnight on the cookie sheet. Storing tip: Keep treats in an airtight container and store in the freezer for up to a month. Cut the sweet potato into small chunks. Boil the sweet potato chunks until they turn into a soft mush mixture. 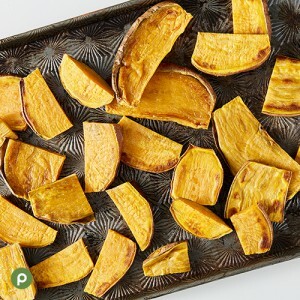 Remove from heat and combine the oatmeal and flour into the sweet potato mixture and stir. Spoon the mixture onto an ungreased cookie sheet lined with foil. Bake at 380° F for 40 minutes. Once cooled, serve to your pet. Storing tip: Keep treats in an airtight container for up to three weeks. Heat oven to 225° F.
Wash the sweet potatoes and check for any moldy skins. Cut each washed potato into ½ inch to 2/3-inch strips and place on a baking sheet lined with parchment paper. Cook the sweet potato strips for 3 to 4 hours. If you want a crispier strip then bake them a little longer. Allow the strips to cool before serving and storing in an airtight container. The Humane Society suggests adjusting the size of each strip to make it appropriate for your dog before serving. Longer strips can be a choking hazard for smaller dogs. 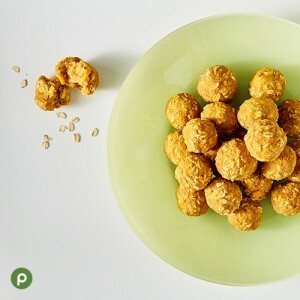 Storing tip: Keep treats in an airtight container in the fridge for up to three to five days. *Consult your vet before feeding your pet any new ingredients. For additional pet treats check out our holiday pet treats edition. Do you have a pet-friendly treat that wasn’t mentioned here? Share it with us in the comments below! Allison L. began her journey with Publix in 2017 and that’s when she realized she found her forever home. With a love for writing and all things trending, she quickly fell in love with being on the social media team and providing premier customer service to all Publix customers! When Allison isn’t learning more about the Publix culture she is usually watching college football with a Pub Sub in hand or riding one of her three horses.